Browse the latest new homes by Churchill Retirement Living nationwide. ​Churchill Retirement Living is a privately owned, family-run housebuilder, and is the UK’s second largest retirement homes specialist. It was founded in 1994 by brothers Spencer and Clinton McCarthy, and has an ambition to be selling 1,000 homes a year by 2019. It has a head office in Hampshire and regional offices across England. 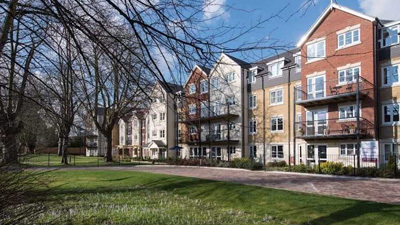 Homes for sale from the housebuilder are apartments designed for retirement living, typically one- or two-bedroom apartments with some communal facilities and a 24-hour hotline available in case of emergencies. It offers services to help buyers, including home exchange, removal services and sometimes help with legal fees and specialist financial advice for the over-55s. The company chooses the sites for its new developments based on location and good transport links so residents are able to easily access local amenities and leisure facilities. Churchill Retirement Homes has won numerous awards over the years, including several WhatHouse? Awards, notably the Housebuilder of the Year title in 2016, becoming the first retirement specialist ever to win. Most recently at the WhatHouse? Awards 2017, it won Bronze in both the Best Regeneration Scheme and Best Medium Housebuilder categories. In 2015, it launched the Churchill Foundation, with Dame Esther Rantzen DBE as its Patron. The foundation aims to transform lives through investment in three areas: the support and wellbeing of the young, the promotion of health among the elderly and the relief of sickness, disease and human suffering. It also supports smaller, local charities with donations. Choose a Churchill Retirement Living development in this area.